Presences: How Do We Know? I love the portal that Robert Orsi has created. He and I share a fascination with “real presences” in the Catholic (and other) traditions and in creating the portal he has highlighted some of my favorite books dealing with presence in the Catholic tradition. I also very much appreciate his essay locating the Catholic insistence on presence in relation to the history of the discipline and his continuing efforts to highlight the extent to which theories of religion mounted implicit or explicit critiques of Catholicism. In keeping with our shared interest in exploring the wide range of issues the topic presents for the study of religion, I’ll add an angle that I find intriguing. The main thing I’d point out is that this idea of perceiving supernatural presences is not limited to personal devotional practice, to those Catholics invested in apparitions of the Virgin Mary, or even to the Catholic understanding of the Eucharist. 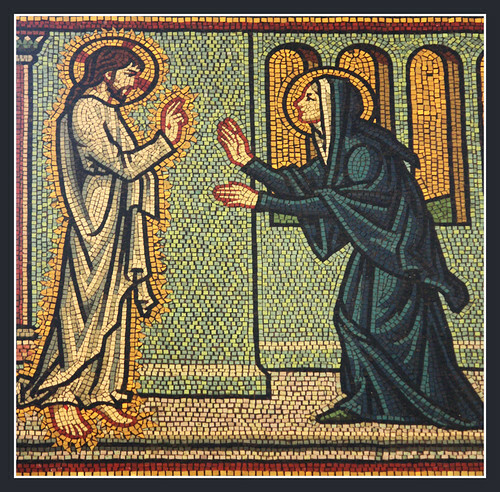 The very basic Christian claim that Jesus was the Messiah rests on the claim that he died and rose from the dead, which in turn rests on the claim that he appeared to Mary Magdalene, the apostles, and then to Paul after his death both as a human presence and then in the breaking of bread. Check out Paul’s letter to the Corinthians (1 Corinthians 15:3-8) to get a sense of how crucial the appearances were in the formation of the tradition. More so than the empty tomb, accounts of the post-mortem appearances of Jesus established the core Christian claim of resurrection and, thus, the revelation that Jesus was the Christ.